“Raise a banner in the land! 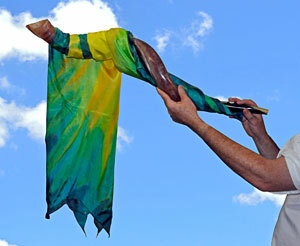 Out of Our Minds Banners now brings you the very best in quality shofars directly from the land of Israel. Intrinsically linked with banners throughout the Bible, our shofars will add an extra dimension to your worship and warfare while also connecting you with the very roots of your faith. Banners were raised and shofars were blown by the people of God every time they moved together, waged war and celebrated victory. The shofar drapped in the "New Growth" wrap. We offer a range of shofar products including: Ram's Horn Shofars, Yemenite Kudu Shofars, Oryx Shofars and Rams Anointing Horns. Hand-crafted using time-honoured techniques dating back to the 14th century, all our shofars are manufactured and accredited under rabbinical supervision. The beautiful workmanship in each shofar exhibits the talents and skills of two Israeli families who have been producing these instruments for 15 generations. Jeremiah 51:27 tells us to “Lift up a banner in the land! Blow the shofar among the nations!” Together banners and shofars announce Christ's kingship, declare spiritual warfare in high places and make perfect partners in worship and intercession. 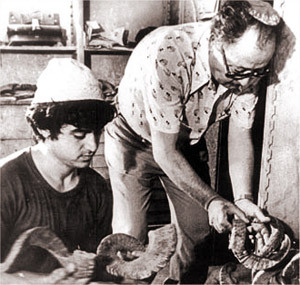 Selecting horns for shofars. ©Used with permission. Not every horn can be used as a shofar. Jewish tradition excludes certain animals. Jewish rabbis believe a bull's horn can not be used as shofar because it reminds people of Israel's sin of the golden calf at Mt Sinai. Others say the word shofar innately refers to a naturally hollow structure as reflected in the word “shefoferes” meaning “tube”. This would exclude the antlers of deer and horns of giraffe which do not meet this requirement. Our Israeli manufacturers import the raw horns from various places around the world, including Morocco, Algeria and countries in southern Africa. Each horn is then meticulously inspected and selected to ensure it is completely free of flaws and is capable of producing exceptional sounds. These raw horns are then transformed into beautiful instruments sought after by religious communities and collectors around the world. Out of Our Minds Banners has individually selected each shofar for its visual beauty and unique sounds. Please keep in mind the photos you see on our web site are a guide. Every horn is different, resulting in a completely unique shofar. For more information on our shofars, see our Shofar History and Shofar Basics pages. For more information on our shofars, see Shofars through the ages and Shofar Basics. To find a shofar for sale, visit our Shofar Products.